With only three chords--D, G and A7--beginning guitar players can start playing guitar right away, with lots of amazing songs. In fact, if you know these three chords you can even start playing “Happy Birthday”--and that means you and your guitar can be the lynchpin of any birthday celebration for the rest of your life.That’s cool! Of course, as a beginner, it can be hard to figure out songs which are simple enough to play along with. That’s why, in this blog post, I’m giving you a list of songs which can be played with only these three chords--D and G and A7. And I’m even giving you links to the audio, tutorials, and music charts. This is guitar gold! D and G and A7 are super beginner friendly...plus they are the very first three chords we teach in the NYC Guitar School Guitar for Absolute Beginner Class--meaning that this extremely handy blog post is also companion resources to the NYCGS Beginner Class! If you DON’T know D and G and A7 yet: Fear not, immediately either click this link for FREE and easy online tutorials on how to play those chords or sign up for a lesson or class right away at NYC Guitar School. If you DO know D and G and A7: That is awesome. Grab your guitar--because one of the best ways to practice is by playing along with songs! Now, remember, because you are a beginner, sometimes we will be using D and G and A7 to play songs even though the original artist used different chords. Q: Wait, Dan--you mean even though we don’t know the chords that the original artist is playing, we can still play along? Using only D, G and A7? That sounds kind of crazy. Is that allowed? Can we do that? A: YES WE CAN! SI LO PUEDE! But we’re going to need two special tricks, called capos and transposing. Don’t freak out! It’ll be easy. First, we’ll simply place our capos on a given fret in order to play along with a song. For example, let’s say a song is played using the F# barre chord, like “Give Me One Good Reason” by Tracy Chapman (one of our potential 3 chord songs!) Wow...that is so inconvenient for a beginner who doesn’t know barre chords yet! However, using the miraculous properties of a capo, a beginner can play that song using the beginner friendly D and G and A7 chords, simply by placing the capo on the fourth fret. (If you need a capo, you can MAKE YOUR OWN with a PENCIL AND A RUBBER BAND or you can buy one--here’s a pretty good one. Similarly, in some cases when you click on the link to the chord chart the song will be charted using chords you don’t yet know. Don’t worry, because in those cases we’ve listed how many half-steps to transpose the song--which in practice just means clicking the little “transpose” button on the chart until the only chords showing are D, G and A7. It’s that easy! One more quick tip: chunk it, baby! Whenever you have a big job to do, doesn’t it make sense to break it into easy to accomplish chunks? Yes, of course. Here’s a nice chunk for you to focus on--when you change from D to A7, your first two fingers are in identical positions! The only difference is that in a D chord your first two fingers are on the 1st and 3rd strings, and in an A7 chord they are on the 2nd and 4th strings. Time to start rocking! Here’s a list of songs, along with where to place your capo (if applicable) plus links to the song, tutorials and charts. How convenient is that? 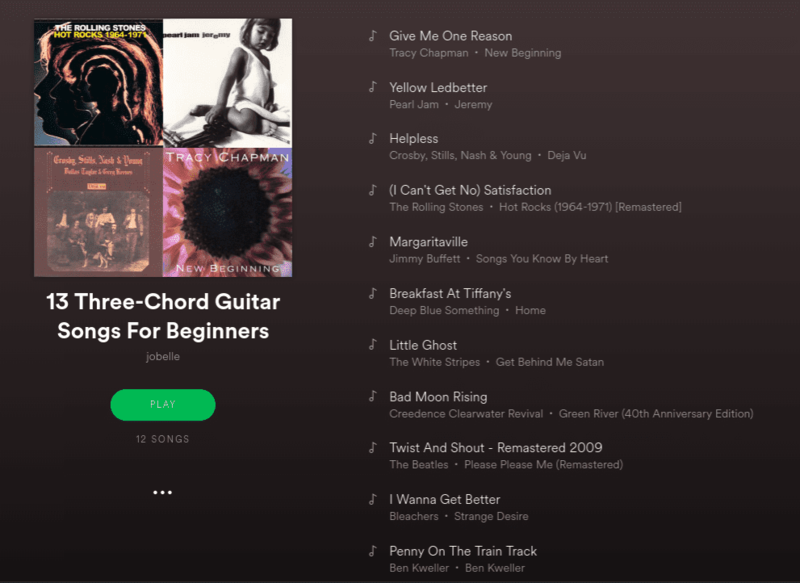 For super convenient playing along, grab your guitar, then check out our YouTube Beginners 2 playlist or our Spotify playlist. ***Every once in a while links break...please let us know if you notice a broken one!